Two new train stations made it into the Sound Transit 3 plan — one for walking and bus access in North Seattle, the other for park-and-riders in South Kirkland. 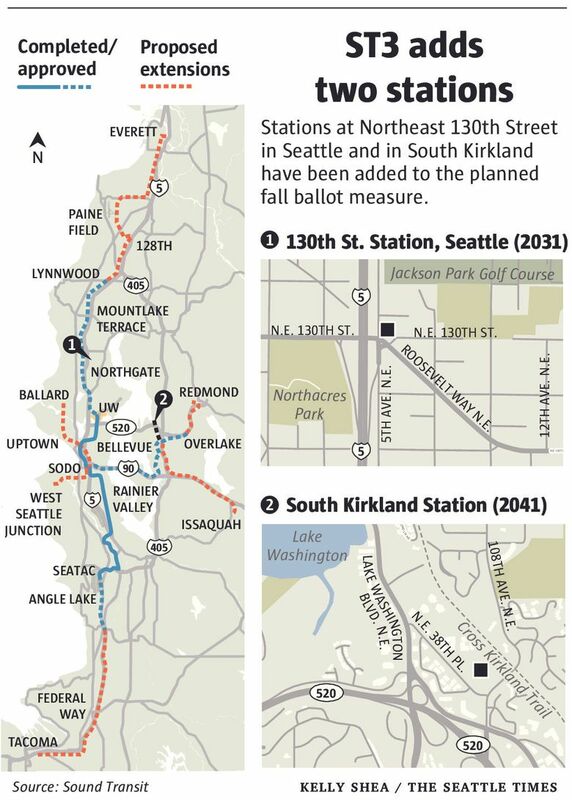 As a Sound Transit 3 plan speeds toward the ballot, two light-rail stations were added this month in North Seattle and South Kirkland, despite ridership estimates that appear weak. What the areas lack in population density, they add in geographic balance so Sound Transit can promise service to new, valuable blocs of voters for the fall campaign. In North Seattle at least, the city is revising its land-use plan to add 1,500 households, to make a proposed Northeast 130th Street Station more useful. “What it doesn’t mean is a bunch of expensive one-bedroom condos, but you have affordable housing for families, two or three bedrooms, where you can walk to a transit stop,” said Seattle City Councilmember Debora Juárez. She had threatened to withhold her support for ST3 if that station, in her district, didn’t make the cut. Now she’s jubilant. Kirkland officials appear more ambivalent about Link and, unlike Seattle, they are counting on massive expansion of park-and-ride capacity to feed the trains. And it sets the community on a possible course to eventually build transit alongside a trail. Both stations look like a done deal among transit-board members, who vote Thursday on which projects reach the fall ballot. The $54 billion, 25-year package promises 62 more miles of light rail, to create a 116-mile network serving a half-million daily passengers, plus Sounder commuter train and bus-rapid transit expansions. If voters in urban Snohomish, King and Pierce counties approve, the median household would pay $400 more a year in sales, car-tab and property taxes. 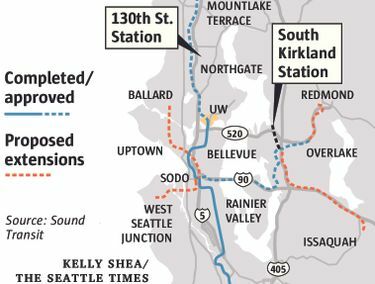 A Bellevue-to-South Kirkland extension costing $307 million, to open in 2041, would be added to the $2.3 billion Issaquah-Eastgate-Bellevue line proposed in March. There also would be a 500-stall, $28 million parking garage — that’s $56,000 a space — added to the existing 785 spaces. Sound Transit predicts 2,500 boardings a day. By comparison, the Tukwila International Boulevard Station, with half the parking, already draws more than 2,700 weekday boardings, aided by RapidRide bus links and many more apartment complexes than South Kirkland. . Trains would save seven minutes compared with riding bus-only from Kingsgate to downtown Bellevue, but people would have to make a bus-to-rail transfer at South Kirkland, said Kathy Brown, Kirkland public-works director, at a May 3 City Council meeting. Dan Ryan, a North Kirkland commuter who has written blog posts backing a light-rail extension into Kirkland, said he can imagine Bellevue growing so crowded that buses can’t get downtown, and that the rail advantage improves. “You want to have a place like South Kirkland Station,” he said. The 500-stall garage should be designed so that 1,000 more stalls could be added later, Kirkland Councilmember Dave Asher said May 3. Yet the council worries about adding traffic there. The full Kirkland-Issaquah corridor is estimated to cost $20 per boarding and $141 per new transit user, among the highest costs in an analysis compiled for the state-appointed ST3 Expert Review Panel. Sound Transit spokesman Geoff Patrick said such figures are no longer used in funding decisions by the Federal Transit Administration, because they ignore the benefit to people who trade their slow, crowded bus trips for rail. The nearby Highway 520 bridge, now fully funded by a statewide 12-cent gas-tax increase, will provide bus-carpool lanes across Lake Washington. So those heading to the University of Washington or downtown Seattle may prefer a direct 520 bus to a light-rail ride that follows a circuitous Interstate 90 bridge route, farther south. But today’s Eastside is more than a satellite to Seattle. Many backers and opponents seem to agree on a crucial fact: A South Kirkland stop represents a stake in the ground, proving Sound Transit intends to continue on the Cross Kirkland Corridor(CKC), a former freight-train route that’s currently a packed earth walk-bike trail. The city has also discussed buses there. That would entail tearing out vegetation within part of the 100-foot right of way, to build tracks and a new landscaped trail side-by-side, divided by barriers or fencing. A neighborhood group called “Save Our Trail” opposes ST3, even though the route would end at the Bellevue-Kirkland line. Beyond it are Watershed Park, small wetlands, and trees that veil suburban estates and town homes. “There are a lot of us who say, this is beautiful. How can you concrete 60 feet of this and make it noisy?” said group leader David Greschler, walking the trail in a drizzle last week. Concept drawings show rail needing 30 feet; Greschler’s figure includes a buffer zone and trail paving. Balducci said trains wouldn’t necessarily follow the CKC, and exact routes would be subject to study, with a final decision possibly 20 years away. The revival of this stop illustrates how Seattle’s 2015 district elections for City Council are transforming politics. A station would forever be associated with Juárez, who spent her first five months this year as a council member pestering Sound Transit publicly and privately, after the transit board did not include a Northeast 130th stop in planning last year. Without it, she says she would have withheld support, and community groups would have resisted ST3. The location is ideal for east-west bus and bicycle connections to the Lake City and Bitter Lake apartment clusters, each a mile away. A bus lane could be striped onto Northeast 125th Street, where lanes were reduced in a 2011 road diet. “These communities have high concentrations of communities of color, English-language learners and low-income households. Car ownership is below the citywide average,” so people are desperate for travel options, Juárez wrote in a Seattle Times Op-Ed. The train stop, to open in 2031, would perpetually add 42 seconds of trip time for riders to or from Shoreline, Mountlake Terrace, Lynn­wood and Everett. Similar trade-offs exist south of Sodo, where proposed stops at South Graham Street and Boeing Access Road would reach more people but add minutes. In addition, the Jackson Park Golf Course and Northacres Park are close to two of the four corners where Interstate 5 and Northeast 130th meet, so space is limited to add housing, within the customary half-mile walk to transit. Sound Transit estimated the $80 million station would attract 2,500 weekday riders in 2035 but add only a net 500 riders for Link overall, because it would draw people away from Link stations at Northgate and at Northeast 145th. Supporters say that analysis ignores how congested the driving and bus paths are to those two places, which include park-and-ride stalls. “From Broadview to Lake City, there’s tremendous support, because Northgate and Northeast 145th are terrible places to get to,” said Renee Staton, a Pinehurst Community Council member. This spring, the city’s draft 2035 land-use plan named the 130th Street Station area as the city’s only new urban village, shown as a diagonal blob between the park and golf course. It would be one of the more dramatic land transformations in city history, as large-lot residential blocks are gradually replaced with compact housing, and mixed-use buildings. At a target of 1,500 housing units and 400 jobs, the area would absorb roughly as much growth as Bitter Lake, Fremont, Mount Baker or Columbia City. Juárez says that as a 30-year resident, she keeps an ear to the ground, and hears enthusiasm for rail and density. If anti-growth feelings ever do boil over, they will become her challenge.